A better way to search and collaborate on your home search. Keep track of all homes in one place. Invite your parents, spouse, and friends. Share comments about the home so it’s all centralized. Receive automatic price and status alerts. Compass has raised 1.2B in funds from companies like Soft Bank and Fidelity and is investing some of those proceeds into the tech, which includes a platform for agent but also build outs for consumers. If you need help, I'm available to screen share via Google Meet or BlueJeans video conferencing and walk you through the set up or we can set it up next time we meet. But like most apps, it's fairly straight forward with an intuitive user interface built by ex apple, google and facebook designers and engineers. The link to the App Store and outline are towards the bottom of this message. With so many listings out there and so many different ways to communicate, it’s not easy to stay on the same page. 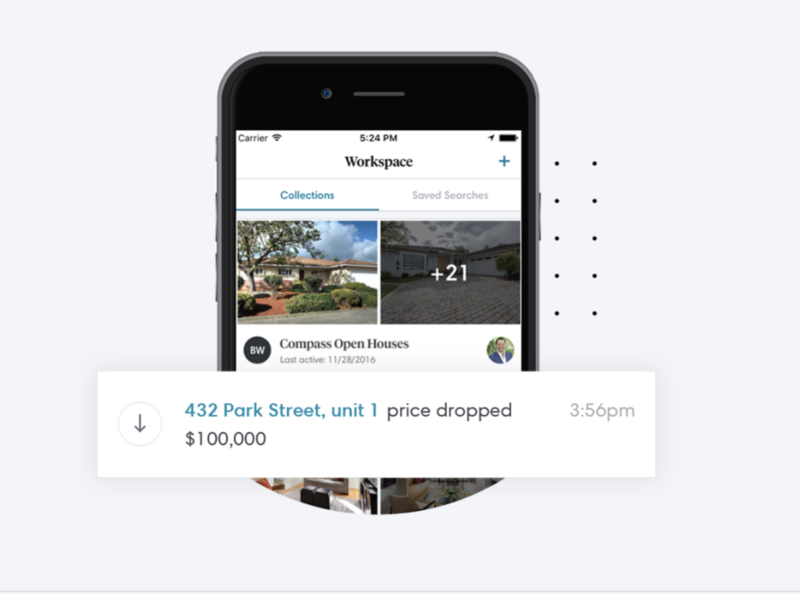 That’s why Compass created Collections, a visual online space for us to organize the homes you want to see, get instant updates from each other, and make decisions together. 1. Sign in to your account on Compass.com. 2. Click on your name in the top right corner of your screen, and then select “Collections” from the drop-down list of options. 3. There you’ll see the Collection of homes I saved for us to review. 4. You can also search Compass for listings, and save the ones that interest you by tapping on the star (save) button. 5. Add any comments to your listings in the collection to let me know what you think and if you’d like to schedule a tour. I’ll save listings there for you, too, so we can find your perfect home. Tap the “not interested” button on any listings you want to hide, so we can narrow down your search. 1. You have access to coming soon and off market listings. Compass recently purchased Pacific Union, which at the time was the 3rd largest brokerage by transaction volume while we were the 5th. This now makes us the largest brokerage by transaction volume in the state & third in the nation. 2. Culture. Compass hires agents on reputation and mindset. They call other agents in our community and past agents we’ve worked with on previous transactions to ensure we put the client first, are collaborative, and have a problem solving mindset. And they require a minimum production level from each agent, which means you not only work with active Realtors but the best and most respected in the community. At Compass, the typical agent has an average sales price of 1M, and many post their listings as coming soon in our private portal before it's showcased to the public via the MLS. By extension, this gives any buyer working with a Compass agent a slight advantage since our firm leads in market share both in LA & California. 3. Collections is a one-stop centralized personal search hub where property data, notes and both of our feedback will live and remain. No need to scroll through emails or text message threads to search for a listings address or old notes. I make a concerted effort to input all of my feedback in the comments section of the property in our shared collection. Effortlessly click save or not interested. Additionally, if you add questions or a tour request to tour in the notes section of a specific listing, me or someone on my team will be notified via email and and work to find the answers or set up a showing and reply back with confirmation as soon we have it scheduled. Collections, our visual workspace is a fully customize your search experience, and now has access school district and transit information. Am I going to be constantly bombarded by emails and notifications? Absolutely not. The latest version of our mobile app allows you more freedom to personalize your search settings. Work with me to adjust the notification frequency to meet your specific preferences. What type of information can I access on the app? We’ve integrated school information, transit details, and neighborhood data—plus, you can now set up your search to filter by multiple criteria. In addition, the latest update empowers us both with enhanced map views and more visible time-on-market status. Download Compass Real Estate in the App Store Today By Clicking Here.